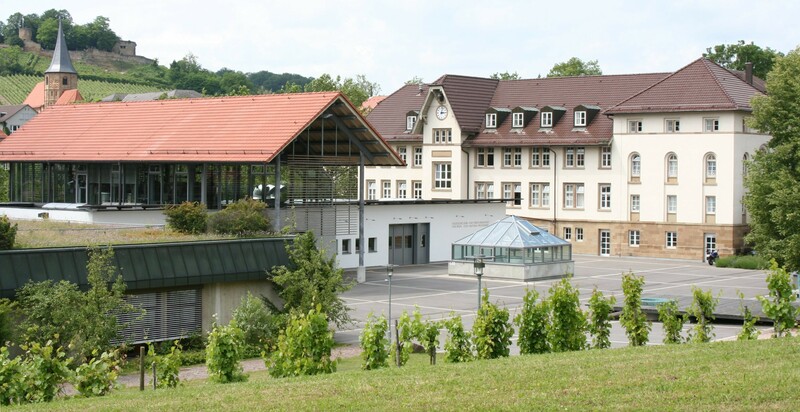 The State Educational and Experimental Institute for Viticulture and Fruit Growing (formerly "Weinsberg School of Viticulture and Obstacles") is located in the town of Weinsberg in the German state of Baden-Württemberg. This oldest viticulture school Germany On the initiative and according to the plans of the vine expert working in Weinsberg Immanuel August Ludwig Dornfeld (1796-1869) and opened in 1868 as "Royal School of Viticulture" under the Wurttemberger King Charles I (1823-1891). The first director of this school of viticulture was Christian single (1816-1869). The well-known vine farmer August herald (1902-1973), from which many new breeds originate, took over in 1928 the direction of the Württembergische institute for vine breeding and vine grafting in Weinsberg. After the Second World War, he led from 1945 to 1964 his former business, which had been incorporated in 1947 in the State Academy of Wine and Fruit Weinsberg. This page was last modified at 9 November 2018 at 20:12.